Well, August is certainly here. And there have been a few ugly moments, for sure. Frayed nerves thanks to overcrowding and heavy demands on the infrastructure. No room to breathe and everything a bit frantic. Concern over the drought stresses the sense of competition over resources. People watching each other’s consumption of water. Awareness that the cash cow of tourism is half over and it’s time to make money for the winter slow time. I’ve managed to get through ten LifeLine programs. I don’t exactly feel like a pro, but it’s getting easier in some ways. Woof, but the learning curve is steep. Now that I’ve reached my short term goal, I need a longer term goal. Fifty episodes? Will I be any better at this after fifty episodes? To what end? What will I have to show for it? Fifty self-indulgent blathery 2-hour audio segments with odd music? Long term planning is difficult in general in a life where “Anything Can Happen and Usually Does.” It’s like what I once said about the goal of circumnavigating. If I ever do it, it will be an accident. “Oh look, here I am in Berkeley again.” That’s how that would happen. But I’m not in Berkeley, I’m in Avalon. The falconry is as intense as ever. The birds are testing me the way horses will when they know there’s a newbie at the helm. Trying to find out what they can get away with. 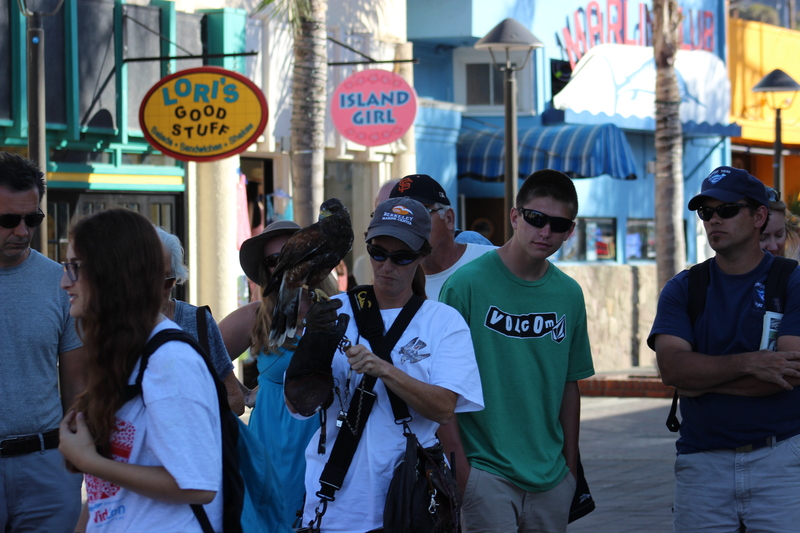 Paying attention to the bird while answering tourist questions is a challenge. It only takes a moment for the bird to get into trouble so my concentration cannot waver while the bird is in the air. This entry was posted on Thursday, August 15th, 2013 at 3:39 pm and is filed under Relationships. You can feed this entry. You can leave a response, or trackback from your own site.